a yard of scoured natural fiber fabric (I'm using white Kona cotton) - the length i'm using is 10 x 16 in. 4.5 inch square template - you can cut one yourself, or simply use an acrylic ruler like I did. 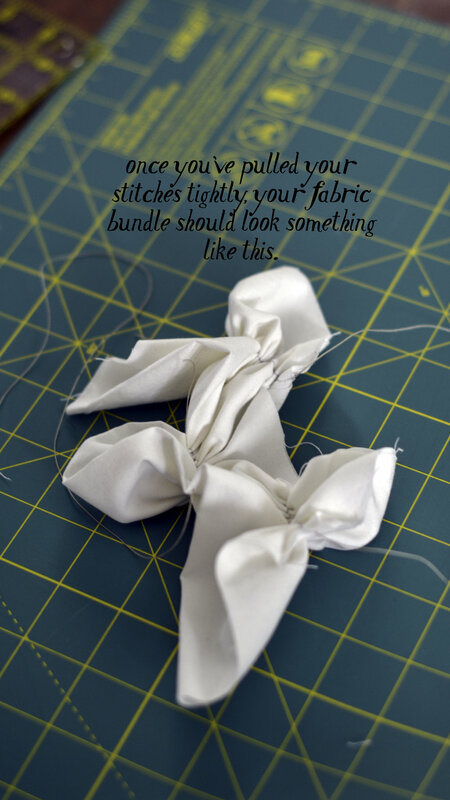 Fold your fabric in half. If you fold in half once, you'll have a central row of diamonds down the middle with half-diamonds along each edge. If you fold additional times, you'll have more pattern. I find that starting with one fold is easiest to manage. You can iron this edge if you really want to, but I don't know anyone who wants to do more ironing than they absolutely have to, so feel free to skip that. Use your square template (or corner of a ruler) to draw triangles along the folded edge and the raw edges of your fabric. For this example, I measured 3 inches between each triangle, but you could easily use more variation for a less regular resist pattern, or not measure at all. I always find it's better to start with a measured pattern, and then you can experiment more from there once you understand the basics. Stitch along each line with a simple running stitch. Knot one end of your thread, but leave a long tail on the other edge--I typically leave at least 10 inches. Don't stress too much about straight, even stitches, but you do want to make sure you have enough stitches to have a tight seam. I recommend .25 inch stitches. But again, don't stress too much. This is supposed to be fun! Once you have stitched each triangle, pull the thread tight. Almost like you're pleating or smocking the fabric. We're in the home stretch now. This is when that 10 inch tail you left while stitching comes in handy. You can then wind the thread tail around each bundle. The more you wrap, the more white will emerge in the pattern. Additionally, the more fabric you leave exposed, the larger your central dyed portion of each diamond will be. Tuck the end of the thread under the wraps, or knot off to avoid the thread coming undone. Wet the fabric thoroughly in clean water, ensuring even coverage. Wring out the fabric, and dye in indigo vat as you would any shibori piece. I dipped my sample 3 times for around 2 minutes each in a ferrous indigo vat. I let the piece oxidize fully between dips. After your last dip, wait for the fabric to dry completely--this helps ensure crisp resist lines. Once dry, snip the thread holding each bundle together and carefully unwrap your shibori creation.